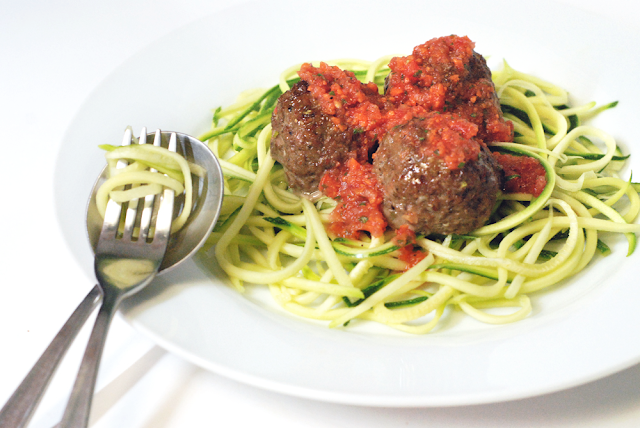 Our latest zucchini pasta is 'spaghetti' and meatballs! We rarely eat meat, but when we found grass fed beef, we decided to buy some. 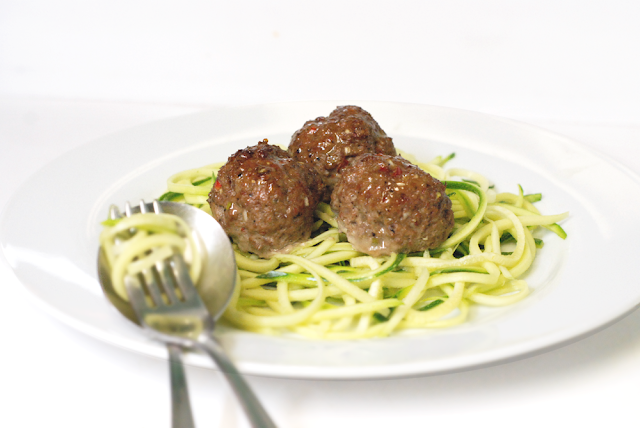 We are still incorporating raw foods daily, so we combined raw zucchini with healthy and juicy meatballs (see recipe below.) This recipe is very tasty! You can feel energy from the raw zucchini. The meatballs were baked in the oven after marinating in an onion, spice and pepper mix for 20 minutes. It is a great choice for meat lovers who are on a grain free diet. Enjoy! 1. Chop garlic, fennel, leeks, red onion and red pepper. Set aside for 5 minutes. 2. In a large mixing bowl, add ground beef. Set aside. 3. In a small mixing bowl, beat an egg and then add onion mix. 4. Using a hand blender, blend/purée egg, garlic, fennel, leeks, red onion and red pepper. 5. Add ingredients to beef in large mixing bowl. Then add spices. Mix well. 6. Cover the beef mixture and marinate beef for 20 minutes in fridge. 7. In the mean time, preheat oven to 325 degrees F (at bake). 8. Prepare your sauce. Directions are available here. Set aside. 9. 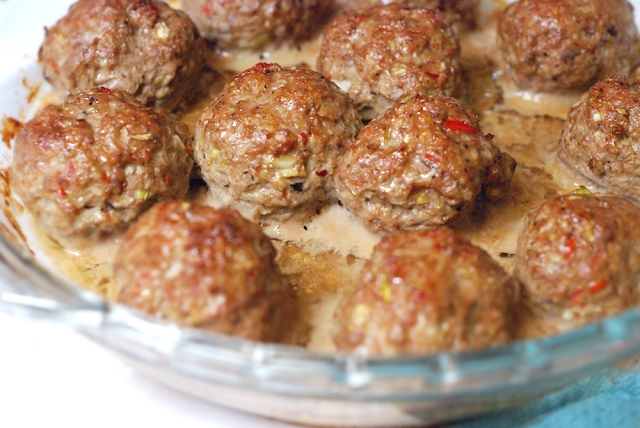 Once beef has marinated, make medium-large size meatballs and place in an oven pan that is lined with coconut oil. 10. Bake meatballs for about 15-20 minutes, then turn oven from 'bake' to 'broil' and bake another 10 minutes. (This will cook more of the top of the meatballs). 11. Once meatballs are browned, remove from oven. Set aside. 12. Using a julienne peeler, peel 2 whole zucchinis (until you reach the seeds). 13. Distribute evenly onto 2 plates. 14. 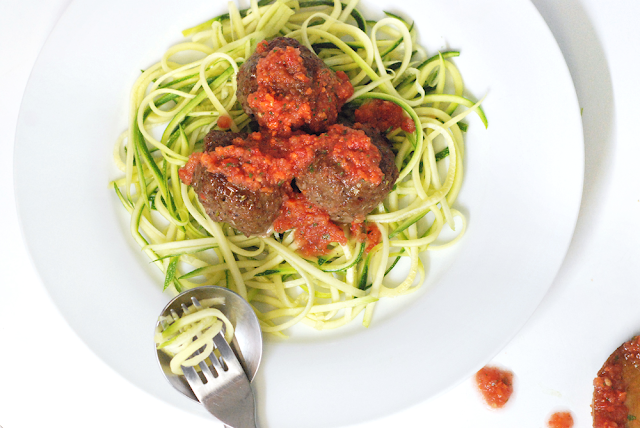 Add meatballs on top of zucchini spaghetti and then pour your choice of tomato sauce over top. This looks delicious, like all of your dishes!! I am curious about the beef...did you mean "grass-fed"? There are no measurements for the spices or beef (package can be 12oz or 16oz) and you have ingredients in your directions that are not listed in the ingredients list such as egg, carrots, and tomatoes. I found the recipe instructions frustrating and am currently "winging it". I have yet to taste it..
You're right. That was a mess. Sorry- I forgot to fix the recipe after making some changes to it (an updated tomato sauce). Hopefully the updates help. Do u warm or cook zucchini at all? I don't cook it so that it's live with enzymes. The meatballs will warm it up slightly but not kill the enzymes. It's a healthier way to have it than cooking off all the nutrients zucchini provides. I made this last night, it was delicious and healthy! I made this last night it was delicious and healthy! Welcome to 'Our Earth Land'... if you are interested in living a healthy and sustainable lifestyle, I provide information on building sustainable homes and eating healthy organic, gluten-free, dairy-free and sugar-free foods. 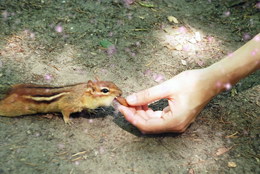 I also share my own food recipes that include, but are not limited to raw food diets. I also provide information on how diet and exercise can reverse and prevent 'disease'! ALL RECIPES are created by Gabriela (unless otherwise stated) and are sugar -free, gluten-free, preservative-free, dairy-free and organic. I do not use or recommend the use of microwaves! The material that appears on 'ourearthland' blog is for informational purposes only. This blog may contain inaccuracies or typographical errors or omissions. We apologize for any such errors, but will not be bound by any such errors. Links to other web sites does not constitute an endorsement of that site, nor of any product, service or other material offered on that site. Photographs are copyrighted ©. Use of photographs is not permitted. ♥ Our Earth Land © 2012-2018 All rights reserved. Powered by Blogger.